Robert Weinberg and Bradley Berman's carefully documented and extensively illustrated book explores the Soviet government's failed experiment to create a socialist Jewish homeland. In 1934 an area popularly known as Birobidzhan, a sparsely populated region along the Sino-Soviet border some five thousand miles east of Moscow, was designated the national homeland of Soviet Jewry. Establishing the Jewish Autonomous Region was part of the Kremlin's plan to create an enclave where secular Jewish culture rooted in Yiddish and socialism could serve as an alternative to Palestine. The Kremlin also considered the region a solution to various perceived problems besetting Soviet Jews. Birobidzhan still exists today, but despite its continued official status Jews are a small minority of the inhabitants of the region. 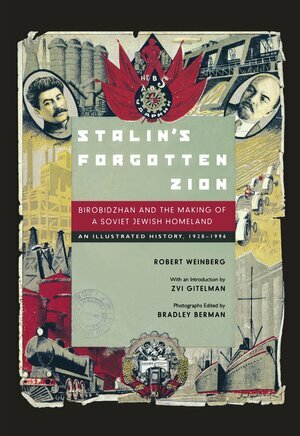 Drawing upon documents from archives in Moscow and Birobidzhan, as well as photograph collections never seen outside Birobidzhan, Weinberg's story of the Soviet Zion sheds new light on a host of important historical and contemporary issues regarding Jewish identity, community, and culture. Given the persistence of the "Jewish question" in Russia, the history of Birobidzhan provides an unusual point of entry into examining the fate of Soviet Jewry under communist rule. Robert Weinberg is Associate Professor of History at Swarthmore College. He is author of The Revolution of 1905 in Odessa: Blood on the Steppes (1993) and coeditor of a book-length edition of the journal Russian History (1996). Bradley Berman is the Associate Curator/Project Director for "Stalin's Forgotten Zion" at the Judah L. Magnes Museum in Berkeley, California. Zvi Gitelman is Professor of Political Science at the University of Michigan and author of numerous books on Jews in the Soviet Union.